On a recent business trip to San Francisco I felt kind of silly not knowing the difference between a cable car and a trolley. Which one runs on the overhead wire and which one runs on the track? Which one is the Rice-A-Roni mobile? After pondering these questions with colleagues and getting some expert advice from our friends at San Francisco Municipal Transportation Agency (or "Muni" as it's known), I have it straight. The next time I'm visiting San Francisco attractions, I'll know what I'm talking about. If it runs on steel rails with a pole connected to an overhead wire above, it's a trolley. Muni's trolley coaches run on electric power lines overhead, reducing emissions and repair costs for the city. If it runs on steel rails with an open slot between them, and no overhead wires, it's a cable car. You can often see people standing on the running boards outside of the cable cars. Simple enough. The world-famous cable cars are the open-aired touristy mode of transportation also featured in the rice commercials and the opening credits of the show Full House. Having had the opportunity to hop aboard one of these, I can attest to the unique experience, especially at night with nothing separating you from the darkness except the metal railing you're holding onto. Easily distinguishable with mustard yellow and dark red accents, cable cars run on underground cables and only go through a small part of San Francisco. San Francisco's Powell-Mason, Powell-Hyde, and California Street lines are the only ones left in the world. The Powell Street cable lines and the F-line form an 'iron triangle' of historic transit service between Downtown San Francisco and Fisherman's Wharf. Cable cars were invented in 1873 by Andrew Hallidie to climb the hills of San Francisco. While the cable cars are still used by commuters, most of the 7 million annual passengers are tourists. Cable cars rank right up there in significant tourist attractions in the city, along with Alcatraz Island, the Golden Gate Bridge, and Fisherman's Wharf. The cable cars are listed on the National Register of Historic Places. There's even a Cable Car Museum in the city with free admission. Another great resource for historic information is the Market Street Railway, which is a preservation partner with Muni. Trolley coaches (aka "trolley buses" or "trackless trolleys") look like buses to me except with overhead wires. "Trolley" refers to the trolley poles on the roof of the bus that are used to transmit the electricity from the overhead wires. I thought these vehicles would look more vintage but they look pretty modern. Trolley coaches offer quieter and cleaner service, which makes up for the "unsightliness of the overhead wires necessary for their operation". San Francisco has the largest trolley coach fleet of any transit agency in the U.S. and Canada. San Francisco's trolley coaches (as well as its streetcars and the cable motors for the cable cars) are almost entirely pollution-free, according to Muni. They also operate better on hills, require less maintenance and live longer than motor buses. Modern trolley coaches even have auxiliary power that allows the buses to travel off-wire for several blocks and avoid anything blocking their normal route, such as an excavation in the street or a street fair. The use of trolley coaches is generally restricted to lines on which a high-enough frequency of service can justify the expense of the electric power system installation and vehicle costs, according to Muni's website. Ok, here's where I got confused again. What's a street car? Cable cars are not to be confused with San Francisco's heritage streetcars, which operate on Market Street and the Embarcadero. Streetcars and trolleys run on steel rails, but with no slot between the tracks, and no underground cable. Unlike the mechanical cable cars, streetcars are propelled by onboard electric motors and require a trolley pole to draw power from an overhead wire. See more here. San Francisco has the world's most diverse collection of streetcars in regular transit service, and many are quite unique and beautiful. This makes streetcars more difficult to classify by sight than the cable cars, which all look similar. According to Muni's website, the story of San Francisco's historic streetcar service began in 1962, when the voters of Alameda and Contra Costa counties and San Francisco approved the $792 million bond issue for BART construction in November 1962. The bond issue included funds for the construction of the Market Street subway, so that Muni's five streetcar lines could be put underground for faster service. The streetcar quickly dominated cable cars as the main choice of transit in the first half of the 20th century because they are speedier. With 100,000 vehicles and 45,000 miles of track in the U.S. by 1918, the streetcar helped trigger rapid urban growth and created the nation's first true suburbs. Aside from trolleys, cable cars, and streetcars, Muni has modern light rail vehicles that run above and below ground, and hybrid buses to help connect surround communities with central San Francisco. The historic streetcars run on the F Market Line and the metro streetcars (light rail vehicles) run in the Market Street subway and on the surface outlying areas. 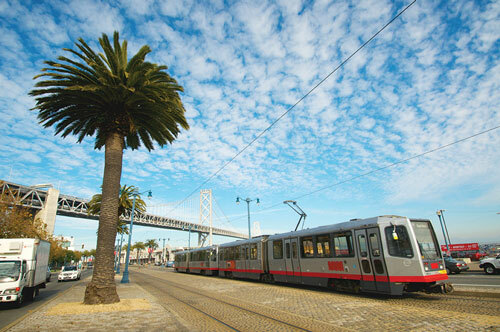 See the whole city and access all the San Francisco CityPASS attractions using any Muni vehicle. The best part is you simply show the driver the cover of your validated booklet and hop on and off for 7 days.